Being well groomed is more than just daily bathing and keeping your head and facial hair looking neat and tidy. It is also keeping the hair and the rest of your body cleanly and neatly shaved. But let’s face it, there are some places on a man’s body that are more difficult to keep well shaved than others. For that reason, finding the right best body groomer for men is a quest that they don’t want to give up on. The ability to reach all areas that need grooming, including chest, back and manly parts. A groomer that doesn’t nick or pull hair especially on those areas where the skin is more sensitive and thinner. A groomer that shaves close on the first pass, resulting in fewer ingrown hairs and less irritation. Based on these criteria, here is a look at some of the best body groomers we could find. 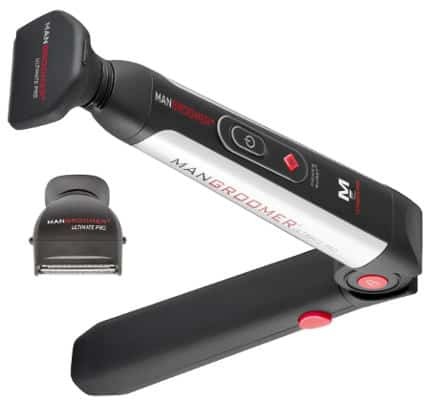 The Mangroomer Ultimate Pro back shaver comes with 2 shock absorbing flex heads, a power hinge and an extreme reach handle. This mangroomer pro follows the contours of your back easily. Users really like it for shaving their back hair because the extended length handle makes it possible for them to do so without asking for any help. The Remington PG 6250 Wettech, Head, beard, and body grooming kit is designed to meet all of a man’s hair grooming needs. This battery operated groomer is designed for both wet and dry shaving. It comes with 5 snap on combs and stainless steel blades. The body groomer head works exceptionally well. 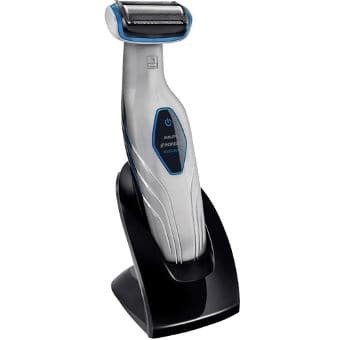 The Philips Norelco BG 2040 is another body groomer designed to trim all parts of the body. In fact, this groomer both trims and shaves so that you trim up those sideburns to keep them neat and tidy, and still be able to shave close enough on other areas of your body to leave you feeling absolutely smooth. It also has a pivoting head to follow the contours of your body. The Gillette Fusion Proglide Styler 3-in-1 Men’s Body Groomer is a slim and easy to maneuver trimmer. 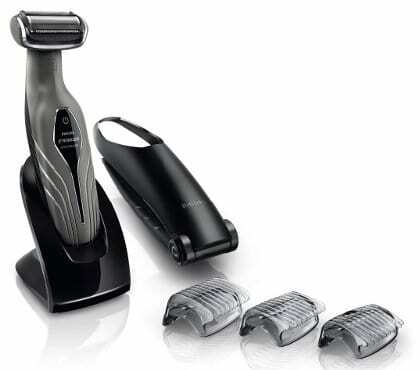 The body groomer comes with 1 trimmer, 1 Proglider power cartridges, 3 combs, 1 battery and an organizer. 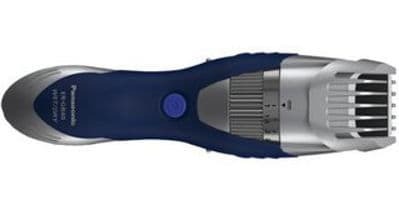 The Philips Norelco BG 2028/42 Body groom 3100 comes with rounded trimming combs, which is helpful during trimming. This groomer is designed to capture long and short hairs in a single stroke. It has a cordless rechargeable power system, so it only runs by body power. 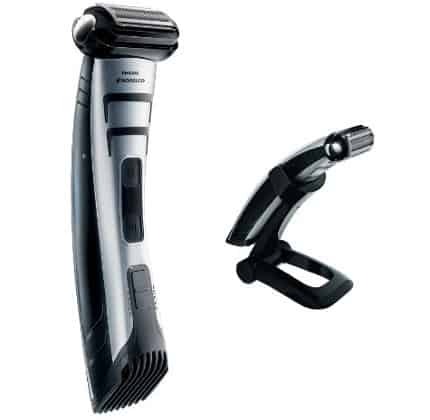 The Panasonic Men’s Wet and Dry Groomer trimmer is designed to be an all in one groomer, for hair, beard and body. It has a unique water drainage system that allows this tool to be completely submerged and then be drained to keep it functioning. It also comes with a rubber grip handle that allows you to keep a firm hold, which is essential when shaving those sensitive areas. 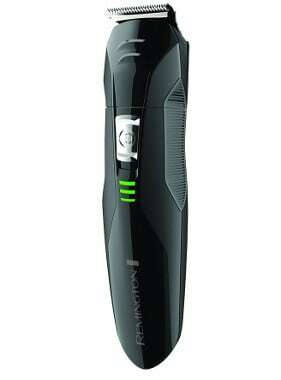 The Philips Norelco BG2038/41 bodygroom 5100 is designed for grooming the entire body. This trimmer comes with 3 combs for various trimming lengths. 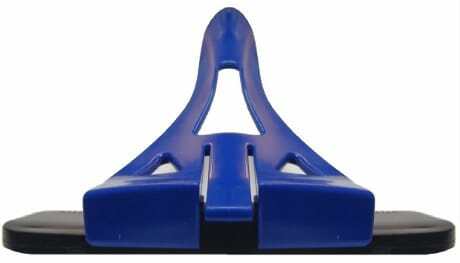 It also comes with an extra long back handle attachment so that you shave you back easily without you needing assistance. 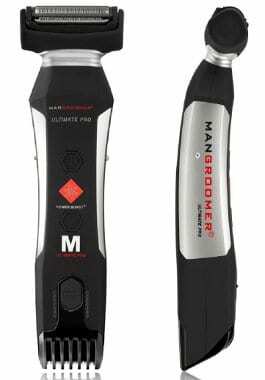 The ManGroomer Ultimate Pro body groomer and trimmer with power burst is designed to shave every part of the body. This is a double sided trimmer with a foil blade that cuts both long and short hair. The flex neck on this groomer follows the body’s contours and offers users the option of either wet or dry shaving. Several users were actually surprised at the power this trimmer had, and others felt it gave them a close shave. At first glance the Bakblades Big Mouth back hair shaver looks like an accessory to vacuum cleaner with its wide flat head, but don’t let this shavers rather unusual appearance fool you, it is actually a well designed shaver to help those who are looking to shave their back. The Remington Products PG6025 All-in-1 Lithium Powered Grooming Kit has 3 attachment heads and 3 combs so that you can trim hair of different heights. 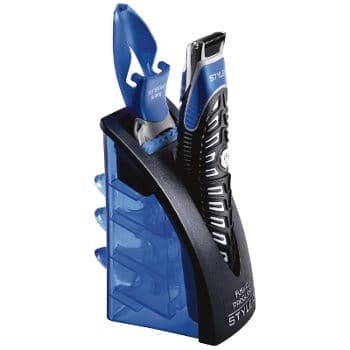 This kit comes with self sharpening blades and all the attachments are washable.